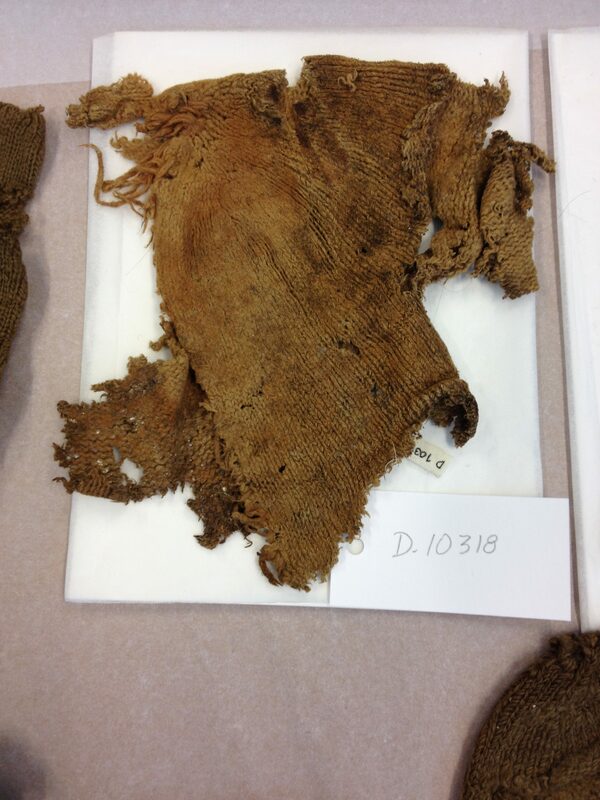 This knitted item, found in a crypt in a Danish manor church, was photographed on the day it was recognised as an Early Modern cap by Jane Malcolm-Davies during examination at the National Museum of Denmark’s store in Brede in May 2014. 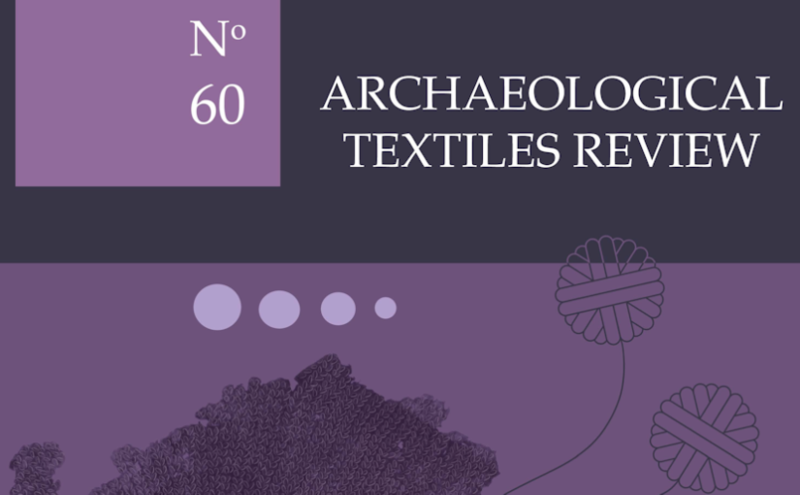 It is recorded in detail in the forthcoming Archaeological Textiles Review issue no. 60 by Maj Ringgaard, together with another cap found in Copenhagen. Click on the image for a larger view. There will also be an article on Karen Finch, our late Honorary President, by her colleague, Rosalind Janssen. The print deadline has been extended, but only until after the weekend, so if you prefer a print copy, reserve yours soon. Subscriptions for the 2018 issue of Archaeological Textiles Review cost DKK250, approximately €34, £30 or US $38, and are available from the University of Copenhagen website http://www.webshophum-en.ku.dk/shop/2018-subscription-archaeological-2310p.html. BREAKING NEWS! 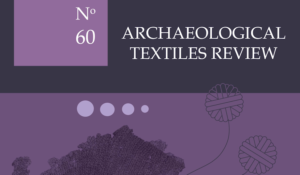 The 60th edition of Archaeological Textiles Review has finally been published. This long-awaited diamond issue is devoted to the study of Early Modern knitted items with more than ten articles focussing on extant evidence, including two sixteenth century caps (one being the earliest known example of Danish knitting), sixteenth century wool stockings, seventeenth century silk stockings, items recovered from shipwrecks including mittens from the Netherlands and Sweden, and the full version of the proposal for a new protocol for recording evidence for knitting (read more here). One of the articles is an obituary of Karen Finch, our late Honorary President. 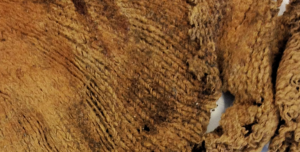 A major outcome of the Knitting in Early Modern Europe (KEME) project, funded by a Marie Skłodowska Curie Research Fellowship, the volume contains 99 pages devoted to knitted fragments and garments with many colour photographs and detailed specifications such as the tension or gauge, yarn and fibre for each item. This issue is available by subscription and the University of Copenhagen is now deciding how many copies to print. Don’t delay! The print deadline is today (12th December 2018). 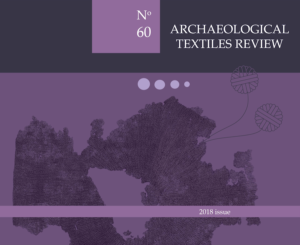 Volume 60 of Archaeological Textiles Review costs dkk250, approximately €34, £30 or US $38. Visit the University website to subscribe: http://www.webshophum-en.ku.dk/shop/2018-subscription-archaeological-2310p.html. Emmy Sale won the undergraduate student Design History Society Essay Prize with an essay based on her BA dissertation examining hand-knitted bathing suits in the 1930s, particularly how they were made and worn by young working women. She wrote a shorter essay, ‘The 1930s Hand-Knitted Bathing Suit: Cost, originality and adaptation’, based on the collection of Worthing Art Gallery and Museum, as part of their joint Objects Unwrapped research project with University of Brighton. A downloadable PDF is available on the Objects Unwrapped website https://blogs.brighton.ac.uk/objectsunwrapped/essays/. Emmy has also written a post for the Association of Dress Historians, discussing her research and showing images of knitted bathing suits in other British museum collections. ‘Homemade Garments in Museum Collections: 1930s Hand–Knitted Bathing Suits’ is available on the ADH website https://www.dresshistorians.org/single-post/2018/10/23/Homemade-Garments-in-Museum-Collections-1930s-Hand%E2%80%93Knitted-Bathing-Suits. Two very different studies on the history of knitting are available online. 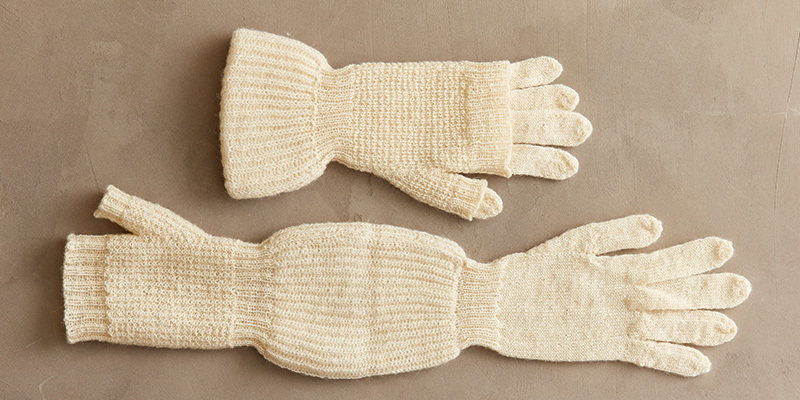 One taps a vein of research that had been hardly explored before, the other re-visits a popular topic of knitting literature, but both dispel old assumptions. ‘Myth: Black People Don’t Knit – the importance of art and oral histories for documenting the experiences of black knitters’ by Lorna Hamilton-Brown can be read and downloaded here: https://drive.google.com/file/d/0B-RM7D5lhgCYV2xHcnljX2g3UzQ/view. Her MA dissertation moves beyond facile ethnic stereotypes, examining art and using oral history from living knitters to record firsthand the experience and culture of knitting among people whose stories are often marginalised or misrepresented. Lorna spoke at the Knitting History Forum meeting last November and her lively presentation both informed and entertained. Roslyn Chapman’s PhD thesis, ‘The history of the fine lace knitting industry in nineteenth and early twentieth century Shetland’, is available in an edited form on the University of Glasgow website http://theses.gla.ac.uk/6763/. 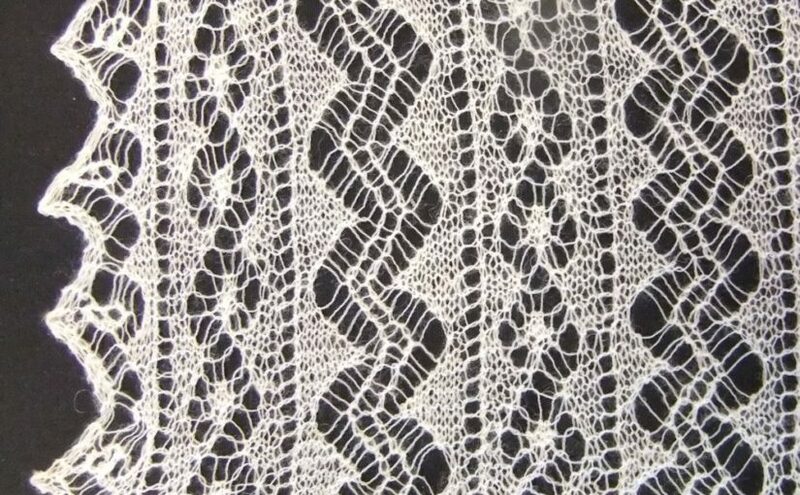 Roslyn’s continuing examination of Shetland lace knitting and its many imitations sheds light on how knitting traditions are created, emulated and sometimes inaccurately disseminated. Her much-anticipated presentation at the Knitting History Conference in 2016 highlighted that traditional narratives of knitting should be evaluated against the historical record. ‘Groundbreaking’ is an adjective rarely applied with sincerity, but the work of both Roslyn Chapman and Lorna Hamilton-Brown genuinely breaks new ground in knitting history scholarship, challenging preconception not by deliberate provocation but research that speaks for itself. Following on from Jana Trepte’s presentation on Saturday, ‘Piecing the Bremen waistcoat together: an everyday knitted garment of the early 1600s’, Pat Poppy has pieced together her own helpful overview of knitted waistcoats and jackets of the sixteenth to seventeenth centuries. The post lists details of select recent scholarship on early knitted waistcoats and jackets, both ordinary and elite, with links to online records of several examples in museum collections. Pat is herself an historian as well as a long-standing member of Knitting History Forum and her post is a sound springboard for further research. Visit her blog to read more https://costumehistorian.blogspot.com/2018/11/early-modern-knitted-waistcoats-and.html. 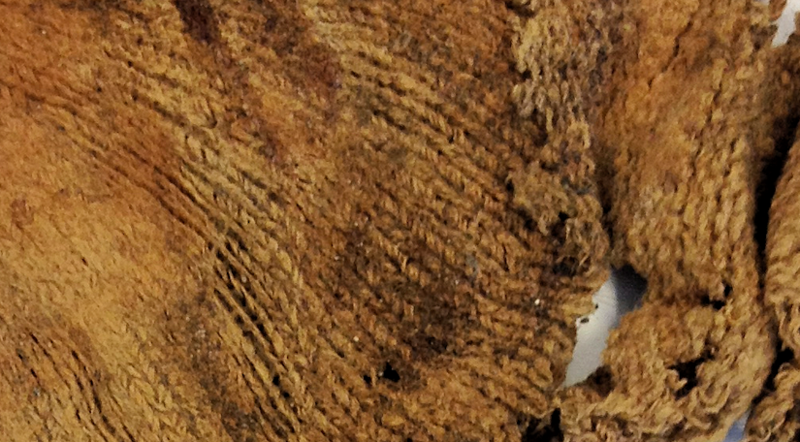 The latest newsletter from the TRC Leiden Silk Stockings Project to study and reproduce those recovered from the Texel shipwreck, shows the progress of the knitters, on course to finish their work by the end of March 2019. Read the newsletter here, in Dutch and English. The group were also recorded for television, which may be viewed here, starting at 7.30 minutes in. Ravelry users can also follow the progress of the knitters on their group, Texelstockings. We are pleased to publish an aid to knitting terminology by Ruth Gilbert, available now for downloading from the Knitting History website. Entitled ‘Words for recording knitting and knitted fabrics. An introduction to important distinctions and concepts’, Ruth’s concise but precise paper aims to avoid confusion by promoting the use of clear and accurate terms in the description of knitted fabrics and artefacts, many of which are already used in machine knitting and in the knitting industry. Please visit our Knitting History Resources and scroll down the page to view or download Ruth’s paper. We are pleased to publish the Bibliography of the history of knitting before 1600, which may now be downloaded from the Knitting History website. The Bibliography was a project of the original Early Knitting History Group, founded by Montse Stanley and now reborn in the Knitting History Forum. It is an unique document, the most complete bibliography of early knitting history currently published and an important aid to research. Originally compiled by Richard Rutt, author of ‘A History of Handknitting’, Lesley O’Connell Edwards has since taken charge of keeping the Bibliography current and relevant. In the nearly two decades since it was published in Bulletin du CIETA n.77 (2000), new work has been published and older work rediscovered. Lesley diligently updated the bibliography over the years and has now kindly permitted publication on the Knitting History website. Please visit our Knitting History Resources page to view or download the Bibliography. We hope this will be a valuable resource for further study into knitting and its origins. Please note that while the bibliography is now open access, permission to reproduce the document whole or in any part must be sought directly from Lesley O’Connell Edwards. She can be emailed using the address in the downloadable PDF. Delegates at the recent Knitting History Forum Conference in London will remember Chrystel Bandenburgh of Leiden University mentioned a forthcoming knitting history initiative in the Netherlands on seventeenth century stocking-knitting. The Textile Research Centre (TRC) Leiden have now announced their exciting new research project. 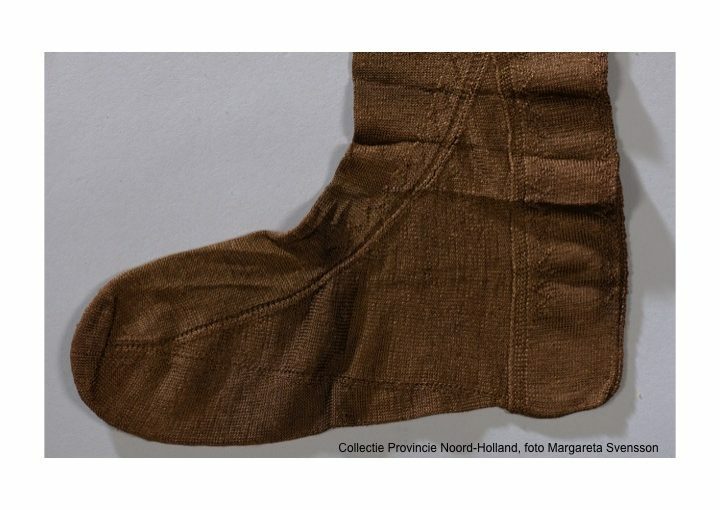 Starting from January 2018 they will lead an investigation into seventeenth century knitted silk stockings, focussing on the examples recovered in 2014 near the island of Texel, from a shipwreck believed to have sunk c.1640. 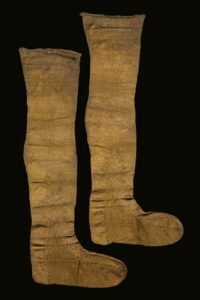 The finely-knitted silk stockings have received initial conservation treatment and are the inspiration for the project, which seeks to discover more information, including how the stockings were originally constructed, if they were custom-made and how they were worn. Through a series of practical workshops and lectures at the TRC Leiden, participants will attempt to create reconstructions using very fine silk thread and knitting needles. The TRC invite knitters to participate in this important project. The first workshop will be held in February 2018, led by Chrystel Brandenburgh and Lies van de Wege (TRC volunteer), and a second two-day workshop will be held in March, with regular progress meetings to follow. 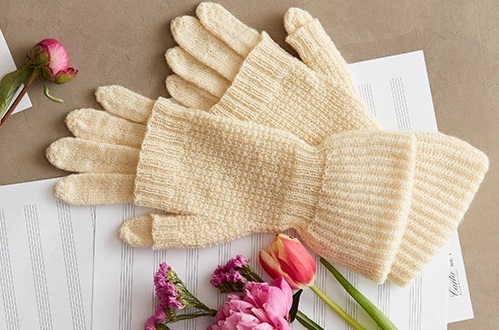 Materials and equipment will be supplied and while expertise in knitting stockings would be beneficial, it is not necessary, though with 1mm knitting needles this may not be a project for the faint-hearted! Interested knitters should email info@trc-leiden.nl directly describing their knitting skills. Further information is available on the Textile Research Centre Leiden website. Strickersvej – Knitters Way is hosting a seminar in August to discuss the KEME project and its findings. There will be speakers on topics ranging from early modern knitted stockings from burials in Bohemia, Moravia and Silesia, 3D modelling, the significance of the spin angle in knitted fabric, knitted items in the Design Museum, Eramus’s caps and comparing sheep fleece characteristics as well as workshops and broader discussions on the KEME project and citizen or crowd-sourced science. The KEME Seminar will be held at the Centre for Textile Research in Copenhagen on Saturday 5th and Sunday 6th August 2017. Further details are available from the Strickersvej – Knitters Way seminar page on Facebook. Shetland Museum and Archives are hosting a free study day on Saturday 5 March 2016, from 10:00am – 4:00pm. “Authenticity in Culturally-Based Knitting” will be the last event from the programme “Knitting in the Round: Hand-Knitted Textiles and the Economy of Craft in Scotland”. The event aims to explore the promotion, branding and marketing of so-called ‘authentic’ Shetland knitwear, and how a strong basis in heritage affects designers and industry alike. Speakers include Professor Lynn Abrams, Roslyn Chapman, Dr Carol Christiansen, Frances Lennard, Rhoda Hughson, Kathy Coull and Helen Robertson. 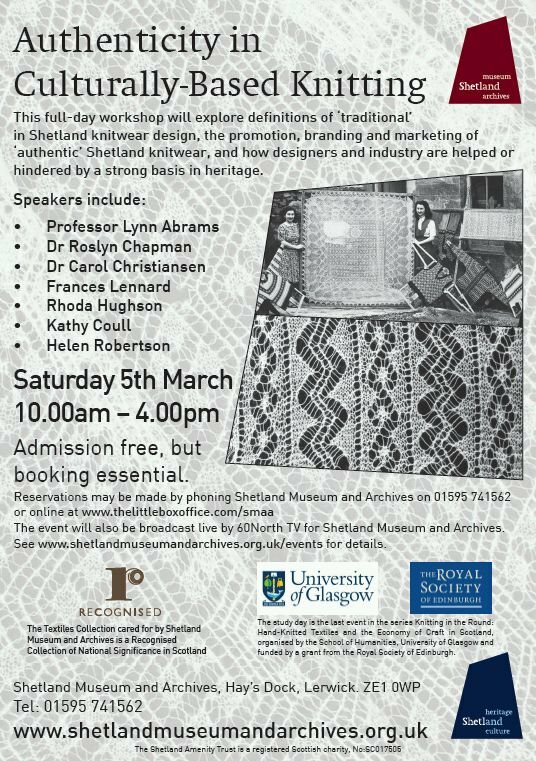 For more details and a programme, visit http://www.shetlandmuseumandarchives.org.uk/events/study-day-authenticity-in-culturally-based-knitting. Booking is essential. Tickets are still available via https://thelittleboxoffice.com/smaa/event/view/39600 or by phoning Shetland Museum and Archives on 01595 741562. If you are unable to attend, you can watch a live broadcast which can be viewed online for free. Check http://www.shetlandmuseumandarchives.org.uk/collections/museum/textiles – a link to the live feed will be added there when available. You can also participate by joining the Q&A session by tweeting questions directly to the Museum, prefixed by @ShetlandM&A. Mary Hawkins, a long-standing member of Knitting History Forum, has spoken more than once at KHF conferences and meetings on framework and machine knitting, still a mainstay of the modern garment industry. She also volunteers at the Framework Knitters Museum in Ruddington. Mary has kindly offered us a very brief tour through the history of machine knitting, from William Lee’s invention of the knitting frame in 1589, to the technological advances of the post-war period. A Short History of Machine Knitting is available to read in the Resources section. A new interdisciplinary research project will be taking a closer look at early knitted caps. The Centre for Textile Research or CTR in Copenhagen and Dr Jane Malcolm-Davies of The Tudor Tailor have been awarded a prestigious Marie Skłodowska-Curie Fellowship for “Knitting in the Early Modern Era: materials, manufacture and meaning“, or KEME. Based at the University of Copenhagen, the KEME team will be investigating in detail more than one hundred extant knitted caps from the Early Modern period, submitting them for technical examination and analysis, compiling an economic map of early knitting and clarifying terminology as a basis for future research to build upon. A database will be developed to make the information gathered in the project available online. Jane will be speaking on “A knitting revolution? A scientific survey of sixteenth century knitted caps” at the Knitting History Forum Conference 2015 in London, Saturday 14th November. Her paper will introduce KEME and she will be appealing for knitters, volunteers and collaborators to participate in the project. A blog, Facebook page and Ravelry group called Strickersvej (Knitters Way) are to launch in November. Read more at the Tudor Tailor website. And don’t forget to book your place at the Knitting History Forum Conference, to hear Jane speak on the KEME project, its aims, methods and how YOU can help.